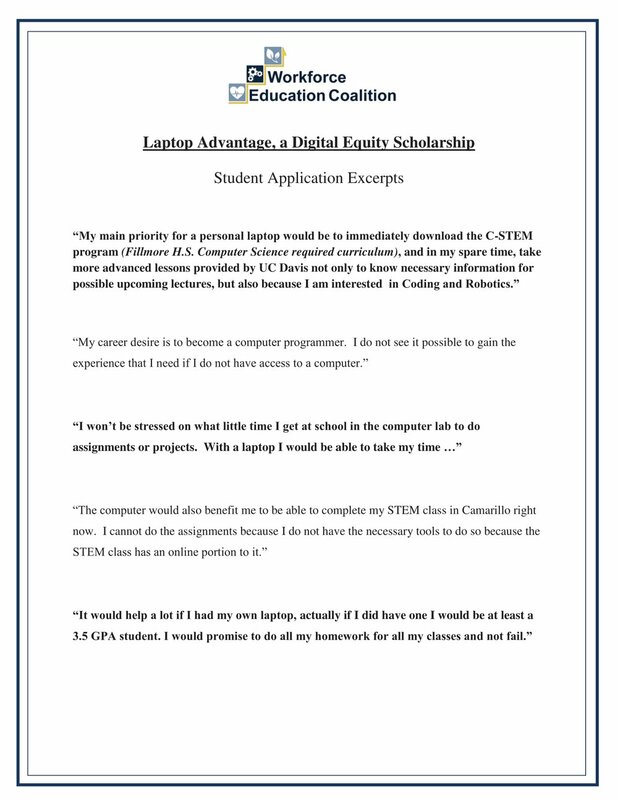 This Digital Equity Scholarship program awards refurbished laptops to low income students who are enrolled in STEM classes. These laptops make it possible for students to succeed in the modern classroom. In 2016, the WEC, through a grant from Alcoa Fastening Systems and Rings, awarded digital scholarships to 45 low income Ventura County students enrolled in STEM pathways. Students submitted an application complete with a teacher recommendation and a short essay. Applicants received high quality refurbished laptops equipped with a Microsoft Office suite, a 4 year warranty, a carrying case, and a flash drive. Starting in 2017, School Tech Supply (STS) Education agreed to purchase used computer equipment that is donated to the WEC. Proceeds from these sales will be used to purchase refurbished laptops for distribution to low income STEM students. Donors complete a short form to help us value the donated equipment, and STS Education picks up the donations at a time that is convenient for you. The WEC will provide donors with a letter to substantiate the tax deduction. "These laptops will help close the opportunity gap between those with the means to have in home technology and those who do not. Access to technology has become a real determining factor to student engagement and success in school." The video, essay, and excerpts below from 2016's applicants demonstrate how important these Digital Equity Scholarships are to our students. The WEC, in partnership with the Alcoa Foundation, awarded 45 laptops to help Ventura County STEM students succeed in the classroom and in achieving their life goals. In this video, 4 VCOE students were surprised with a new personal Dell Latitude laptop loaded with a Microsoft Office Suite, plus a flash drive, carrying case and 4 year warranty.